Are you planning on decorating your house with Christmas lights this year? 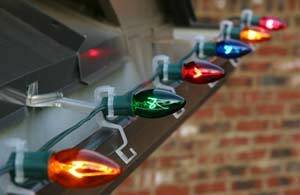 One of the easiest ways to do so is by hanging the lights from your gutters with clips. However, if your gutters aren’t clean, this will be very difficult to do. Clean gutters aren’t just important for Christmas lights. They also prevent water and debris from freezing in your gutters and causing dangerous icicles to form. Cleaning them, however, can be a daunting task for a homeowner who is not experienced with ladders, or is simply afraid of heights. A Better View Window Cleaning would be happy to clean your gutters so that you can hang your lights with ease! Give us a call today at 317-514-8971.